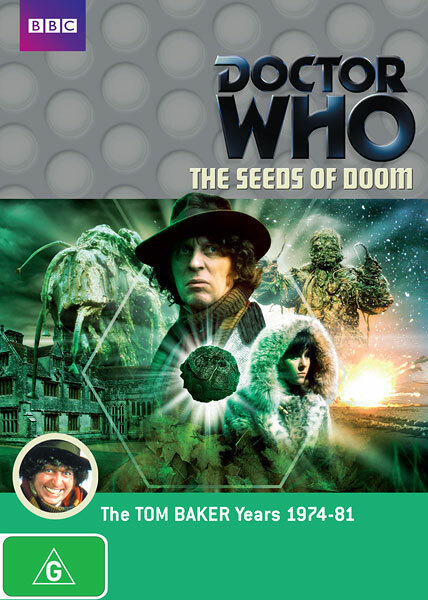 When scientists unearth two seed pods deep in the arctic permafrost, the Doctor and Sarah Jane rush to investigate. Soon the Doctor's worst fears are confirmed: the pods house Krynoids, one of the most parasitic and dangerous life forms in the universe. One of the creatures has already infected a scientist and now a hideous monster is rampaging through the Base, intent on total destruction. This DVD release features digitally remastered picture and sound quality. It is one of the last commercially available copies left in Australia. Special Features Include: commentary, a look at the making of The Seeds of Doom, a look at the music of Geoffrey Burgon, a look at the comic strip adventures of the Fourth Doctor, a look at locations used in The Seeds of Doom, a look at the roles of the Production Assistant and Production Unit Manager, isolated score, trails and continuity, Radio Times billings and Douglas Camfield's Paper Edit, production information subtitles, photo gallery, Easter eggs.